Sound of Contact’s Dave Kerzner Releases New Studio Album “Static” Feat. Members of Genesis, Big Big Train, Porcupine Tree and others! OUT NOW! With a bit of dark humor, sarcasm and a retro-future dystopian view, with rich imaginative artwork created by Ed Unitsky, “Static” merges elements of a twisted Broadway musical with familiar vintage rock flavors like that of King Crimson’s “Red” or Genesis’ “The Lamb Lies Down on Broadway.” Other strong detectible influences include The Beatles, Queen, Radiohead and Kerzner’s late band mate from “Thud,” Kevin Gilbert. Dave Kerzner and his band embarked on a US tour starting with headlining the ProgStock festival on October 14th in New Jersey where they performed all of the album “Static” live and then headed over to Chicago for the Progtoberfest at Reggie’s on October 20th. From there the Dave Kerzner Band and fellow American proggers District 97 continue on their “Static-Vaults Tour” playing in other cities around the East Coast. In February 2018, the Dave Kerzner Band will be performing on Yes’s Cruise To The Edge for the third time with plans to do a short tour of Europe in the Spring. Dave Kerzner’s “Static” is OUT NOW! 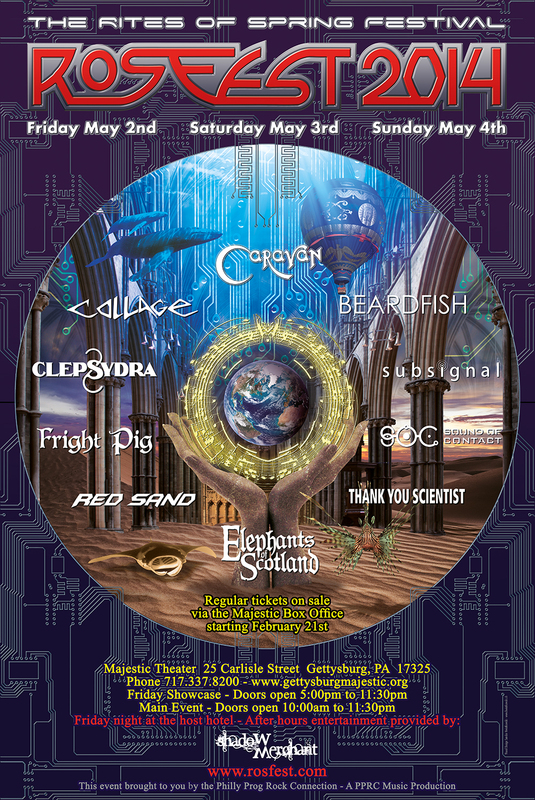 Featuring Caravan, Beardfish, Clepsydra, Elephants of Scotland, Sound of Contact, Thank You Scientist, Fright Pig, Red Sand, Subsignal and Collage! Gettysburg, PA – The most anticipated music festival of 2014, the legendary RoSfest, will take place this year May 2-4, 2014, and will feature progressive rock icons Caravan, Beardfish, Collage, Clepsydra, Sound Of Contact and others! The Rites of Spring Festival, or RoSfest as it’s commonly called, is an annual progressive rock festival held every spring in Gettysburg, PA. RoSfest is in its 11th year, and are thrilled to be presenting UK prog icons Caravan, who has not performed in the US in many years, along with 9 other amazing bands this year. RoSfest has always been at the forefront of bringing new and upcoming progressive rock bands to an American audience, while also bringing in bands that were at their peak during the heyday of prog rock in the 70’s. This year’s lineup features 10 bands over three days, with Friday night’s show featuring Clepsydra (Switzerland) and Caravan (UK). Saturday’s show features Elephants of Scotland (US), Sound of Contact (UK), Thank You Scientist (US), and Beardfish (Sweden). Sunday’s lineup features Fright Pig (US), Red Sand (Canada), Subsignal (Germany), and Collage (Poland). All three days feature a strong lineup with a mix of different sounds and styles within progressive rock. With a history going back to 1968, Caravan is one of a dwindling amount of bands around that merits a description as living legends. They were one of the two principal bands in the Canterbury Scene, a movement that saw bands blending elements from progressive rock and fusion with whimsical lyrics, quirky instrumental movements and a distinct English sound – but often without any major superficial likeness shared between the bands subscribed to this style. Caravan peaked commercially early on, with 1971’s ‘In the Land of Grey and Pink’ their best-selling album. Their early 70’s albums in general are all considered classics today, and while they never made much of an impact in the UK or US in these early days their stature have continued to grow following the resurgence of interest in progressive rock. Following spells of inactivity in the 1980’s and 90’s Caravan have been a mostly going concern since 1995, albeit with a number of line-up alterations along the way. The current incarnation of the band dates back to 2010 and consists of Pye Hastings, Geoffrey Richardson, Jan Schelhaas, Jim Leverton and Mark Walker. Twelve years have gone by since Caravan had their last triumphant return to the US at Nearfest. While Beardfish is still regarded by many as a fairly new band on the scene they have actually been around for more than a decade already, with seven full length albums to their name. Initially renowned for their fairly eclectic take on retro-progressive rock they have developed towards a harder edged variety of that sound in later years, firmly documented on their 2012 album ‘The Void’. An album they finished promoting in October 2013. Multinational band Sound of Contact is a new player on the scene, so to speak, but with a potential that secured them a contract with prestigious label InsideOut for their first release. The instigator of this band is one Simon Collins. As a solo artist he has released three full length albums over the past decade, establishing his credentials firmly prior to venturing out into band and progressive rock circles. A vital part of his music resume and presumably more important for him than many others. Simon Collins is a vocalist and drummer both, just like his father Phil was. And Phil Collins is a musician that easily merits a description as famous. With an already established career, Simon has seen to it that he isn’t merely regarded as the son of his father when now following in his footsteps. 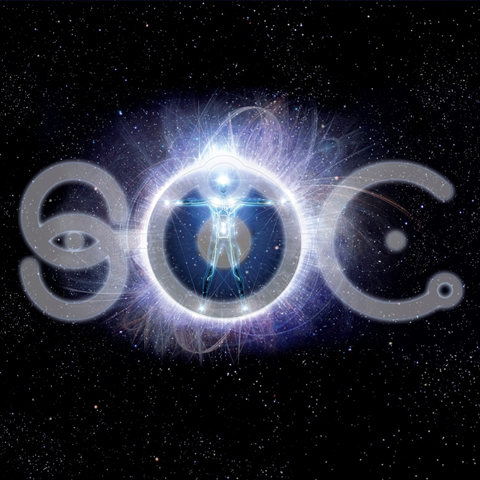 The reception given to Sound of Contact’s debut album ‘Dimensionaut’ in 2013 emphasize that clearly, with a steadily growing number of glowing reviews following in it’s wake. Sound of Contact live, for live purposes consisting of Simon Collins (vocals, drums), Bill Jenkins (keyboards, vocals), Matt Dorsey (bass, vocals), Randy McStine (guitars) and Ronen Gordon (drums). RoSfest once again will be held at the Majestic Theater in Gettysburg. Eighty years ago, the doors of the Majestic Theater opened for the first time, welcoming audiences to the largest vaudeville and silent movie theater in south-central Pennsylvania. Built by Henry Scharf as an annex to the historic Gettysburg Hotel, the theater seated 1,200 patrons and proudly served as the cultural crossroads of commerce, college, and community. Majestic Theater website – http://www.gettysburgmajestic.org/ and click BUY TICKET Tab and scroll down to the show to purchase tickets. Also, doors will be opened at 5:00 pm on Friday, 10:00 am Saturday-Sunday; doors will be closed every night at 11:30 pm. Regular seat tickets may only be purchased on the Majestic Theater website or through the box office by calling (717) 337-8200, or in person at 25 Carlisle Street during box office hours (Sunday: 3-7:30 pm, Monday-Saturday: 12 noon-7:30 pm). Single day passes go on sale Friday March 14th at the Majestic Theater box office for all three days and online. Los Angeles, CA – Hot on the heels of winning Prog Magazine’s Limelight Award for being the best new band in progressive rock, Sound of Contact can announce the release of their acclaimed debut album ‘Dimensionaut’ on double vinyl LP on the 2nd December 2013. This will be a limited edition import in the USA and available through http://www.cmdistro.com. The band is also making the finishing touches to the forthcoming video for new single ‘Pale Blue Dot’ which is once again being directed by Tim Glover who was at the helm for the ‘Not Coming Down’ video. Stay tuned for more information! To purchase Sound Of Contact’s ‘Dimensionaut’ limited edition import double vinyl LP: http://www.cmdistro.com.